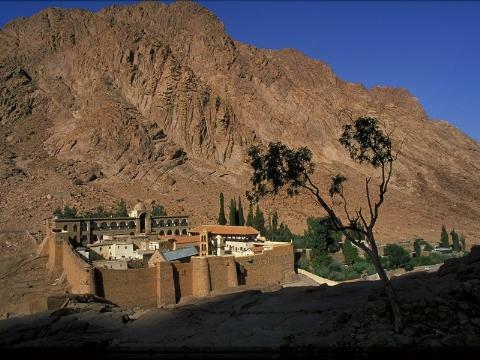 Saint Catherine's Monastery is a monastery on the Sinai peninsula, at the foot of Mount Sinai in Egypt; it is believed to be the peak on which Moses received the Ten Commandments. The mountain is known and revered by Muslims as Jebel Musa. The entire area is sacred to three world religions: Christianity, Islam, and Judaism. The Monastery, founded in the 6th century, is the oldest Christian monastery still in use for its initial function.